Training makes cyclists connoisseurs of excess. The wet, the cold, the discomfort and the gnawing suspicion that you’re depriving your life of something essential by spending so many hours on the bike. On the one hand it’s bleak and on the other it’s a celebration. It’s a complicated set of emotions, and apparently it’s not the cyclist’s alone. Finalists abound here. 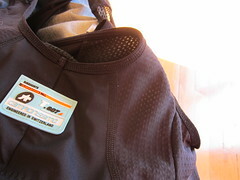 One I’ve been enjoying lately has been the Assos T.607 S5 Thermal Bib Short. Perhaps it’s thanks to my love of the mid-ride pee stop, or possibly because the two-foot long panels of fabric in tights can’t sync to the rpm’s of a pedal stroke as fluidly as the smaller panels of shorts and leg warmers. Whatever the reason, I’ve had a lifelong dislike of tights. Winters in Little Rock were never so heinous that training in bibs plus warmers was a problem. But in our new home of Utah they measure the temps in Kelvin. If there were ever the need to make the leap to tights, this is the time. Thanks to the T.607’s, though, I continue to resist. The brushed interior of the fabric is warmer than you’d ever imagine, and in mating them with Assos legwarmers I happily train in comfort akin to summerweight bibs. I feel none of the pulling, pinching, or sagging inherent to tights. And even though the frigid air makes finding my junk tougher than fishing a gherkin from the bottom of a half-full Bloody Mary, mid-ride natural breaks are an immensely less complicated affair. Another candidate for Product Of The Year is the Osymmetric chainring. I posted a ride review earlier in 2011. I still ride them and dig them. 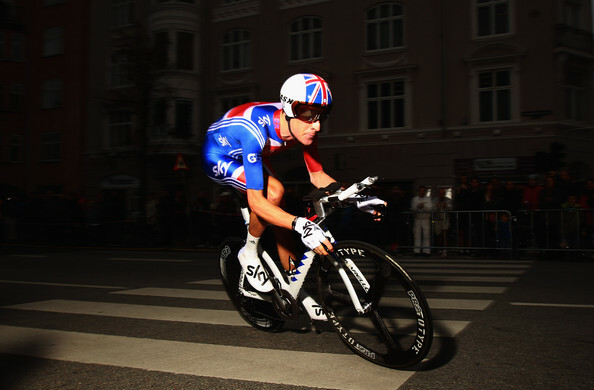 Their use in the professional peloton has only grown — most auspiciously with Chris Froome’s eye-opening performance in the Vuelta, Bradley Wiggins’ silver medal at the World’s TT, and other highlights you’ll easily find by scanning Osymmetric’s Facebook page. One final note on Osymmetric — we’re overdue getting these live on our site for sale. Blame it in the move. Anyway, you’ll see them there soon. And once you buy them, put on a cloak of patience before installing them. It’s an intense process. Stay the course, though, because they’re certainly worth the effort. 2011 was also a year where we unearthed the cure for the pain of choosing the perfect wheelset. 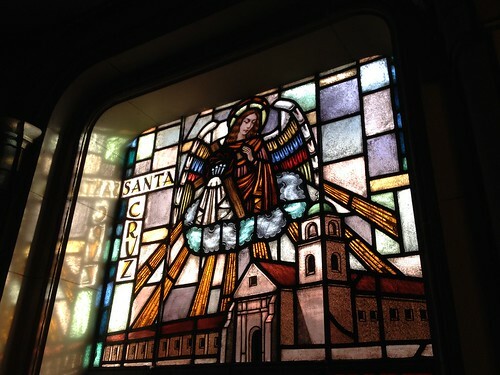 We accepted that no perfect choice exists. Instead, what’s required is to make two good choices. First, buy a Zipp 404 full carbon clincher wheelset. It has no peer in its combination of aerodynamics and lightness along with its Bike Maintenance For Dummies-approved ease of clinchers. Two suggestions for maximizing the ownership experience. Make sure you use Zipp’s Tangente Corkbrake pads. Swiss Stop Yellows are not advisable because they’re noisy and grabby on Zipp’s braking surface. And the difference in stopping power with the cork is big. Also, use long-valve Vittoria tubes since they have removable valve cores and accept thread-in Vittoria valve extenders. You want the Vittoria set-up because the valve extenders replace the tube’s valve core. What you don’t want is Zipp’s stock valve extender since it fits less than air-tight over the tube’s valve core. But the 404 wheelset alone isn’t perfect. Carbon is an unreliable braking surface in the rain, even with cork pads. On days with big crosswinds the 58mm rim depth brings the sort of riding turbulence that’ll have you reaching for the barf bag. And in punishing races like Batenkill or Rouge-Roubaix, the pounding from neglected roads plus the probability of crashing makes a near-$3000+ set of wheels too financially risky for many. 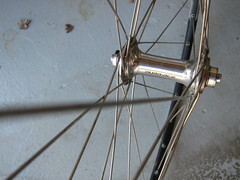 For those situations, throw on a set of 32-spoke handbuilt wheels. You don’t need to get cute with them. Mavic Open Pro rims on Ultegra hubs are all you need. You’ll easily find a set of these on eBay or Craig’s List for less than $200. Buy them second-hand because no bike shop in America can build them up for less than $500 retail due to the high cost of hubs, rims, and labor. Most of the folks who do buy them at their bike shop don’t ride in the rain and wind, or do scary races. In short, ‘used’ handbuilts are almost always like new. With these plus a set of 404’s, there’s no circumstance you won’t be well-armed for. The winner of Product Of The Year? 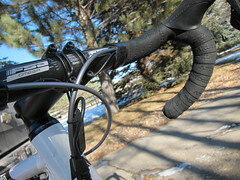 In a year of widespread technological innovation, it goes to a staple item: The FSA Omega Compact handlebar. It has a shallow drop, a short reach, and a progressively rounded shape in the drops that lets you inch your palms fore or aft based to microadjust your body position. Its gentle curvature throughout that offers 45 different ways to be comfortable. One for each of the 45 dollars it costs. Why is it our Product Of The Year? It’s because you can never over-praise the perfect handlebar. You can ride a Di2-equipped Dogma 2. But if it has stupid handlebars your mind will chafe the whole time. But with the right bar, a Rival-equipped bike will make you feel primed to drop Contador. It’s worth pointing out, too, that carbon bars still don’t have traction in the pro peloton. It’s easy to conclude that their slight weight savings or putative stiffness increase aren’t offset by the headaches they present. Pros crash. Pros have their bikes thrown around and stacked up and otherwise get unlovingly handled on car racks and in the service course. Delicate things don’t have a place in world so rough-and-tumble. A new carbon handlebar is plenty strong. But if you take a spill on them, you must inspect them closely. The consequences of not doing so can be severe. That sort of babysitting isn’t PRO, which is why, if you look closely, you see $45 FSA alloy bars all over the peloton. Two frightfully strong contenders came with both fists swinging straight outta Veneto. The Wilier Zero.7 is the rare bike that reveals its brilliance in your first hard pedalstrokes. Wilier aesthetics and frame geometry have long been strengths of the brand. Add to that the Zero.7’s souped up composite technology and an all-new bottom bracket platform, the result is something astonishing. The secret ingredient of the Zero.7 is surely its new bottom bracket, known as BB386. In short, it’s BB30 with a wider bottom bracket shell. 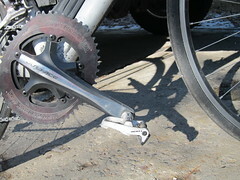 The resulting drivetrain stiffness is as subtle as a fork in a toaster. The gains are noticeable in out-of-the-saddle climbing and big ring accelerations. But the benefit is just as clear in less considered scenarios like the effort of going from super-slow to full-bore out of a switchback in a descent. The gorgeous Pinarello Dogma 2 should perhaps be renamed the Temptress from Treviso. It’s a lighter, stiffer version of the original Dogma Carbon, the bike that earned Pinarello the title of Italian Uber-brand. Like the Zero.7, it does everything incredibly well. Choosing between the two boils down to a few key differences. Wilier strove to build the Zero.7 as light as possible. While it’s 800g-ish mass makes it dreamlike on climbs, the frame also comes with the caveat that you shouldn’t ride it on an indoor trainer. While the Dogma 2 is stronger, it’s a third of a pound heavier. Seeing that delta on the gram scale hurts. But knowing that Pinarello builds their bikes with a tank-like toughness is reassuring. The other difference is aesthetics. Wilier goes for a muted, near-matte carbon finish. Pinarello loves bass boat sparkle. While either one would be a great choice, a different option gets the nod for Bike Of The Year. In the way of explanation, a bit of background about Competitive Cyclist is necessary. There was time where the road snobbishness here was total. That was awhile back and we’ve mellowed. But back in its golden era I remember debating whether driving a team car in Paris-Roubaix was harder than racing Leadville. And even though, by then, Bernard Hinault hadn’t raced in 15 years and probably weighed 200 lbs, I couldn’t back down: Le Blaireau could train for 2 weeks and win any damn NORBA pro race he wanted. In a roadie’s brain, the drawbacks of mountain biking are self-evident: the weirdness of bleeding brakes, the wonkiness of tuning suspension, the mess of tubeless tires, the godawful heaviness of the bikes themselves. But over time the bike industry addressed these issues one by one. In 2011, the final change arrived that makes it so mountain bikes are wholly copacetic in Roadie Land. The boutique carbon 29er hardtail brought the elegance of road bikes and road cycling to the woods. With 29′ wheels, no terrain is prohibitively unruly, regardless of how lacking in nuance your off-road bike handling skills may be. Thanks to the 29er’s oversized wheels, resorting to the heaviness and the tuning headaches of rear suspension are no longer a requirement for high-performance off road riding. A SRAM X.0-equipped Santa Cruz Highball 29′ hardtail weighs little more than an Ultegra-equipped road bike, and requires hardly any more maintenance. Finally, mountain biking technology has found a sweet middle ground between road bikes and moto to make it approachable in a newly far-reaching way. Because of this, the Santa Cruz Highball gets the nod as the bike of the year. It’s an award we’ll ask it to accept on the behalf of the entire category of carbon 29er hardtails.